Fire gives Light. And light drives away darkness. As a matter of fact, lighting a lamp or a candle is symbolic of this in most cultures across the world. What happens if lighting lamps is your job? Imagine driving away the darkness of an entire street! 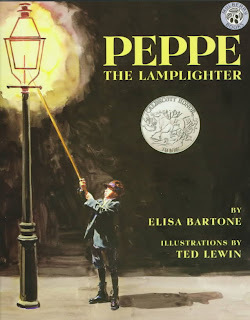 Peppe a little Italian-American boy living in the New York district of Little Italy is a lamplighter. Being an immigrant during the turn of the century in New York is hard. It's harder still to be the only boy in a family of sisters and an ailing father. But what's the hardest? Dealing with his father's reaction to his job. Peppe's father, being a first generation immigrant is typically critical of Peppe's job as a lamplighter in the streets of New York. "Did I come to America for my son to light the streetlamps?" he thunders. But Peppe has tried everywhere and cannot find another job. Besides he loves this one. He likens each lamp to a "small flame of promise for the future". And much like asking for favors in the church, Peppe says a prayer for each lamp that he lights - one for each member of his family. "This is so that Assunta learns good English on the school." " And for Filomena , may she learn to like New York"
"And this one for me, that I will always be able to help Domenico lights the lamps"
It's a ritual that Peppe truly enjoys. But his father's disapproval weighs on him heavier each day until one day Peppe does not light the lamps. He refuses to work against his father's wishes and thus the streets of Little Italy stay dark. What happens then? How does Peppe's father come around? How does Peppe's little sister restore in Peppe respect for this job as being the "most important job in America"? Sometimes when we think of Fire and how dangerous it can be, we forget the beauty of fire- the way it dispels darkness (ignorance in this case) and brings hope and light. The true winner of this moving story is the mouth watering photographic illustrations by Ted Lewin who won the Caldecott Honor for this book. Hi Poppins, We loved this book when we picked it up a few years back. The illustrations are really magical. a great pick. You had me at the first few sentences, Poppy! "Fire gives Light. And light drives away darkness. As a matter of fact, lighting a lamp or a candle is symbolic of this in most cultures across the world." How true. And how apt for the festival of lights which comes at a time when days start getting shorter and nights longer in the Northern hemisphere. The harvest has come in and now is the time to enjoy the fruits of many months of labour and concentrate on things like learning- dispelling the darkness of ignorance. Must pick this one up. I agree it is such a wonderful book and enjoyed reading your review too ! Peppe says a prayer for each lamp that he lights - one for each member of his family. "This is so that Assunta learns good English on the school."" And for Filomena , may she learn to like New York"
sounds like a great pick, Poppy, and love how you brought out the undertone in the book - that of light dispelling darkness, synonymous with ignorance. Satish and Ranjani, I'm glad you enjoyed the book as well. Sounds fascinating! The cover-picture is a charmer. Thanks for this find!